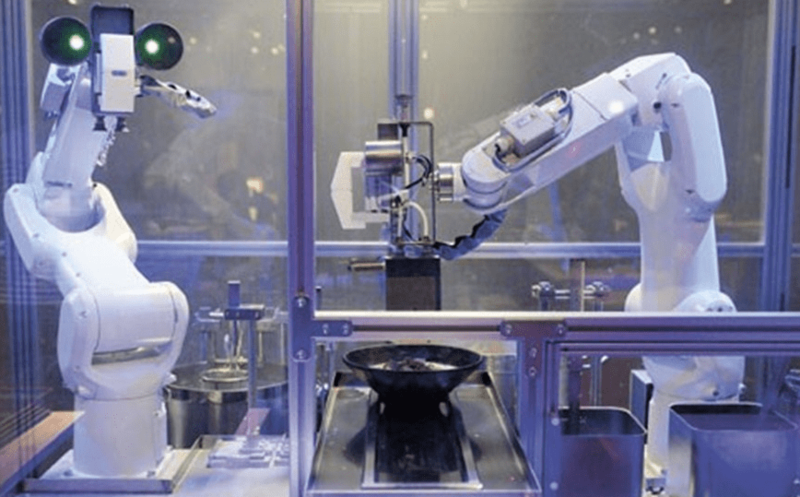 Robot Chef — Residents of Shanghai, China’s largest city, are currently being captivated by a pair of ramen-slinging robot chefs that have taken up residence at a new restaurant. Toyako, a restaurant which opened last month in the Hongkou district of Shanghai, has customers flocking to its store to get a glimpse of its chefs Koya and Kona. Koya and Kona are not your typical chefs, but rather two $154,000 robots specifically designed to make ramen. While they aren’t quite capable of pulling noodles from scratch, the impressive robot arms do handle just about every other aspect of preparing a ramen bowl — boiling water, cooking noodles, and portioning the soup with appropriate garnishes such as eggs and meat — in just 90 seconds. But as impressively high-tech as the ramen bots may seem, they’re not actually a new invention: Similar robots have been in use in Japan since way back in 2009. And robot restaurants are already all the rage in China; there’s even one inspired by the Disney Pixar film Wall-E.
Toyako serves four types of ramen: seafood, fried fish, beef in brown sauce and braised pork, however the robots can only make the beef variety, according to owner Liu Jin.